Steve and Judi relocated to Yea after many years of living in the city. The search for the right property took several months, the main criteria was that the property had some mature trees. We finally purchased our home 5 years ago with plans to renovate the existing cottage and garden. Unfortunately the house was too far gone. As owner builders we settled on a Harkaway home with the belief that it fitted into the local area very well. As for the garden, the bones were already in place, however very overgrown. Many, many trips to the tip later and our dream of creating a peaceful relaxing garden to share with friends and family began to take shape. Judi is keen on propagation, several Abutilons are testimony to her successes along with many other plantings. Many original plants were rescued before demolishing the original home. Along the front picket fence roses abound, under planted with iris, erigon and spring bulbs. A superb pure white Magnolia, several Manchurian Pear, Agapanthus and Hydrangea also feature in the front garden. 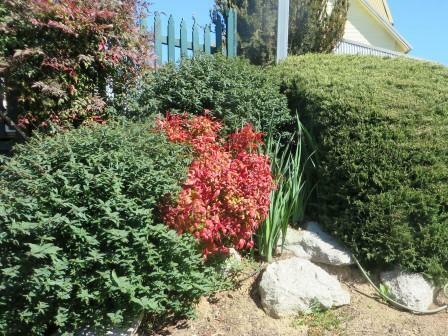 With the abundance of native birds we have incorporated many natives to protect and feed them. 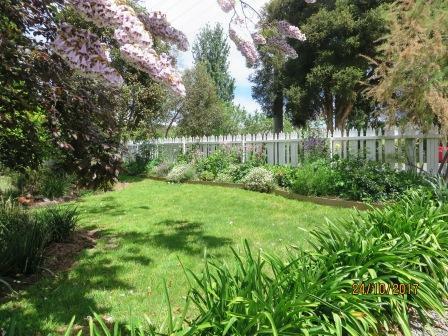 The rear of the large (3/4 acre) garden reveals sweeping lawns, many shade trees, more roses and a variety of fruit trees. We endeavour to produce as much food for our table as we can, so a very large vegetable garden takes pride of place, supplying most of our needs, plus more to share. The garden continues to evolve and bring us much joy. A double front border of roses makes a glorious splash of colour to greet visitors plus a pretty little side garden full of colour which leads to a mighty screening hedge. The green, silver and red tips of the hedge form a striking entrance as well as providing excellent screening from neighbours. The house is built on a steep slope but the garden has been successfully tiered to provide easy access to all areas. 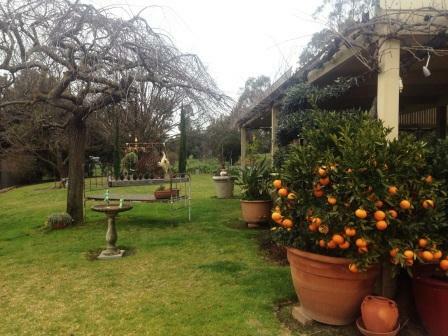 The front garden is filled with flowering shrubs, succulents and citrus trees which are loaded with fruit in the winter months. Tall Tree Ferns provide a shaded and sheltered area outside the main living area of the house giving a wonderfully cool aspect in the summer and are underplanted with violets and hydrangeas in Evelyn’s favourite colours. The small pool off the Patio was there when Eveline bought the house 15 years ago and Eveline enjoys it for the exercise. The small garden beside the pool is her ‘whimsy’ garden and was created to surround the lovely mermaid feature. She has been surrounded by water iris and reeds to encourage the frogs. A steeply sloping bed is filled with more roses, succulents, nandinas and colour, with highlights of yellow, another favourite colour! 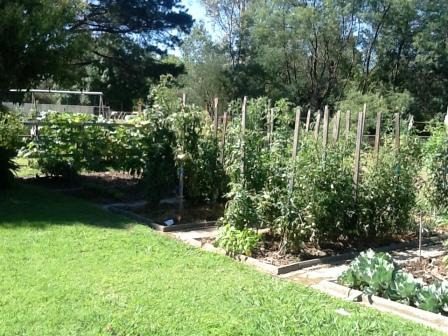 The raised vegetable garden at the rear, sports a thriving artichoke but the rest is being abandoned because it is too shady and another mighty hedge gives excellent privacy to the back garden. The Green Gym was purchased in 2010. The established house had little garden surrounding it apart from 1 or 2 sem i mature trees. Maggie’s vision was to create a productive garden from which she could share the fruit, vegetables and herbs with family and friends. She also considered it to be a place where she could put aside increasing work pressures and return to the basics of a fit and healthy lifestyle, hence the name, The Green Gym. The row of ornamental pears along the front fence, are stunning in blossom and were planted to create shade for the front of the house. 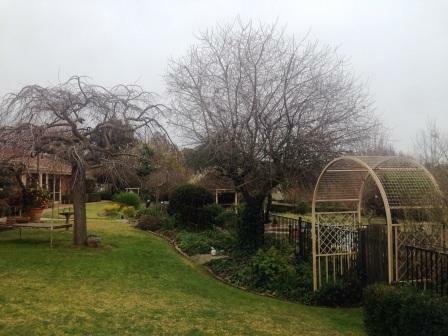 A nectarine tree, mulberry tree and table grapes along with a multi grafted espaliered pear tree were added to the back garden. Another feature of the rear is a circle garden bordered by an English box hedge. Within the circle you will find pencil pines, carpet roses and bay trees. Like all good ideas they don’t always go to plan and after a catastrophic health event Maggie’s vision for her garden had to be reconsidered. 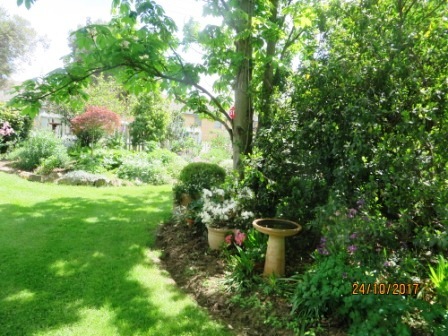 During her many months of rehab the garden was watered and cared for by Rotary members and for that she was very appreciative. Confined to a wheelchair Maggie now took on the role of “Supervisor” and with help has created her beautiful garden. As you walk around Maggie’s garden you will see raised vegetable beds 800mm high for easy access, along with many pots of mixed herbs. Arches holding wisteria and Cecil Brunner roses divert your attention to shade gardens containing hellebores, beaded iris and mock orange creating scents throughout the area. Maturing trees of birch, weeping cherry, and a beautiful Silver Princess provide shady areas towards the rear of the garden. Birds of many varieties now visit the garden and water features for them to enjoy are scattered throughout. A large painting of a wedgetail eagle created by Mark Klein, an artist from Cathkin, adorns a boundary wall. 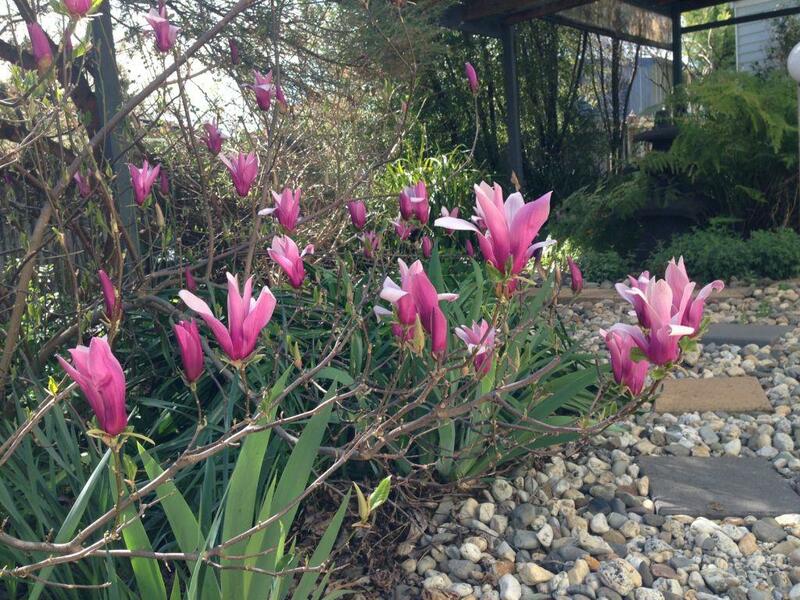 Maggie’s garden is an example of what can result from hard work and determination. As you enter the pr operty at Killingworth Hill you meander down the driveway, lined on the right by semi-mature London Plane trees and on the left by a mix of native shrubs and gums. The garden was established more than 30 years ago to complement the newly built house and swimming pool. As you approach the house, the driveway opens up to show a large ornamental pear, a stand of birch trees and an impressive display of authentic farm relics. Mixed garden beds border brick paths leading to the entry gate of the home garden. Features of this garden are a large standard Elm tree, an ornamental grape bordering the outdoor entertainment area, potted fruit trees and an espaliered olive tree. The fenced pool area includes a rose covered gazebo and summer shade is provided by plantings of variegated tulip trees and flame maples. Pass through the gates alongside the pool where stone steps lead to vistas of the farm paddocks and a large dam. Look to the right and you will discover the covered fruit orchard and chicken run revamped from the no longer used tennis court. 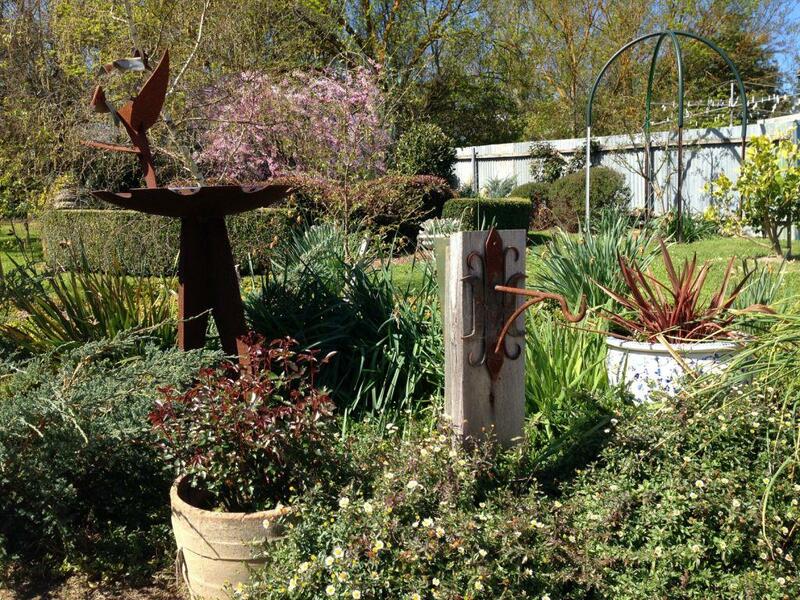 Garry and Leslie’s garden is complemented by conventional and quirky garden sculptures. They recently opened a café and whiskey bar on site and the décor represents a rustic, traditional Australiana collection that is the product of decades of searching and dedication. 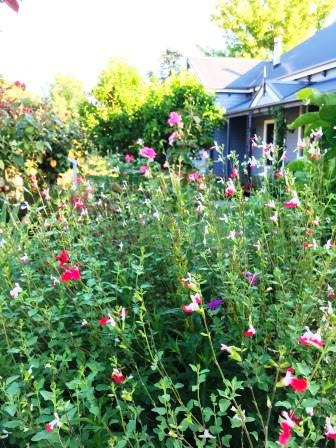 The Yea Garden Club annual plant sale, which is held in conjunction with the Open Gardens Weekend, can be found at “Abutilon”, the lovely garden of Kevin and Myrna Patterson at 5 Welch Street, Yea. Hundreds of potted treasures are available at bargain prices. Visit the newly planted Taungurung Indigenous Bush Food Garden ‘Badji Baanang’, planted by descendants of the local Taungurung tribe, at the YWater and Tourist Information Centre.